The 2014/15 season marks the 40th anniversary of Wanderers' memorable run in the FA Cup - a run that saw the Club reach the Third Round Proper for the first time in their history and attract widespread media attention. 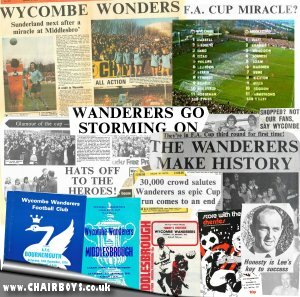 Chairboys on the Net will look back on that run on a round by round basis, with match reports, memorabillia and memories published to correspond roughly with the anniversary of each game. We would be delighted to hear from anybody with their memories from those games and especially the more unusual memorabillia, such as match tickets, posters, photos and national press coverage. Despite reaching the Second Round Proper the previous season, an administrative error at the Club led to Wanderers having to set out in the First Qualifying Round of the 1974-75 competition. The historic run also came during a season of change for the Wanderers, as they entered the first season in English football with the 'Amateur' status of players dropped. Wanderers had competed as 'Amateurs' since their formation around 1887, with the Isthmian League regarded as one of the premier Amateur leagues. The change in status led to uncertainty in certain quarters about the structure of Leagues outside of the Football League. Club Secretary Bert Crump, commenting before the start of the season said, "We have no rich benefactor, and are entirely dependent on our own efforts and the gates at our home matches." However, for Wanderers, having beaten Football League opposition for the first time in the FA Cup the previous season, while also capturing the Isthmian League Championship for the third time in four seasons, expectations for the 1974/75 season were understandably high. Also speaking at the start of the season, Club Chairman Jack Smethurst commented "None of us can guarantee anything in the way of success but the policy of the Club has always been about the quality of play. This is something we believe in and can guarantee. We can also guarantee that the players will be fit and, poviding he opposition allows it, we guarantee a full measure of entertainment. We can guarantee, for our part, that there will not be the scenes at Loakes Park as were witnessed at Wembley last Saturday which were a disgrace to the game which reflect the lack of discipline that has grown up over recent years in life generally." The Wanderers Chairman was referring to the 1974 Charity Shield match between Leeds United and Liverpool, where Billy Bremner and Kevin Keegan were both send off for fighting. Player movement between non-League clubs at this time was also uncertain. It was quite typical that a player would not make a decision on who to play for until the opening game of the season. Manager Brian Lee had built up a strong side since his arrival at the Club in 1968 but he could do little to prevent key midfielder Larry Pritchard returning to Sutton United following four seasons at Loakes Park where he scored 57 times in 200 appearances. Pritchard's replacement turned out to be Howard Kennedy, a school teacher with experience with the reserve sides of both Burnley and Leeds United. Other new players included central defender Alan Phillips who agreed a move to Wycombe following the break-up of a very successful Hendon side. Hendon had reached the Third Round during the 1973/74 - bowing out to Newcastle United in a replay played at Vicarage Road, Watford. All but one of that Hendon side would leave during the close season. Other new arrivals included midfielder Dave Alexander, a student from Durham University who played four times for the Arsenal reserve side the previous season. Meanwhile, other departures confirmed on the opening day of the season included defender Phil Wood, young winger Tony Price and left-back Roger Grant - the latter moving to Hitchin Town. The loss of Grant and the arrival of Phillips initially meant that Dave Bullock switched to left-back until the arrival of another former Hendon player Gary Hand, who had started the season at Ilford, a few weeks into the new season. Those changes led to a relatively small squad of players but one where a fantastically consistent line-up would set new milestones for the Club. Lee would call upon just 16 different players during the 1974/75 League and FA Cup campaigns. They team would open their FA Cup campaign on Saturday 14th September 1974 with a trip to the winners of the Marlow v Aylesbury United Preliminary Round. It would be Marlow who took that tie and so entertained Wanderers in a match where Brian Lee's side were huge favorities against a side playing in the Athenian League. But Wanderers' passage to the next round would be far from easy. Extras and Credits - including video, audio and PDF downloads.